There are many photos of the M1 Carbine rifle in use by American troops during WW2. The following is a collection of its use by other forces. In the early morning hours of December 18, 1944, the American 14th Cavalry Regiment, 18th & 32nd Reconnaissance Squadrons, conducted a recon along the road between Poteau and Recht, in Belgium. Fog and darkness hindered visibility. They ran head on into the lead armored elements of the an SS Panzer Division, Kampfgruppe Max Hansen, part of the 1st SS Division Leibstandarte SS Adolf Hitler unit. The reconnaissance group was no match for the Panzers and was over run in short order. Taken by total surprise and quickly overwhelmed, many of the Americans fled their M8 armored vehicles, personnel carriers, and jeeps, leaving some of their equipment behind. The SS members captured the equipment the Americans left behind, which amounted to nothing more than bits and pieces of two reconnaissance squadrons. In December 1944 things were not going well for Germany. In an attempt to boost support and morale, the German command in Berlin had ordered photographers of the German propaganda units into the field during the Ardennes Counter-offensive. Propaganda photographers were “embedded” with the SS Kampfgruppe Hansen when they encountered the American reconnaissance group. Soldiers in same SS unit as above. An assortment of weapons being distributed to a group of German and Latvian soldiers in Nymindegablejren, Denmark as Hitler ordered all the Axis troops to fight to the death and not surrender. 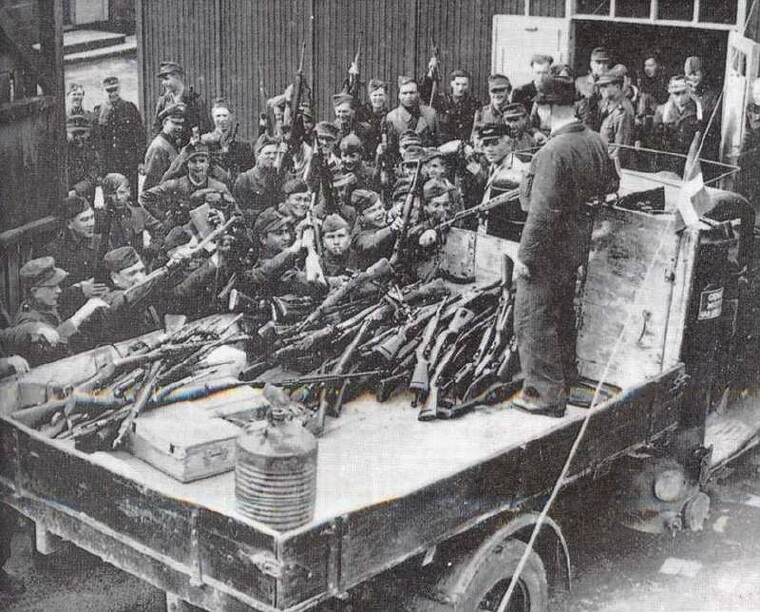 Note that there are several M1 Carbines on the bed of the truck. 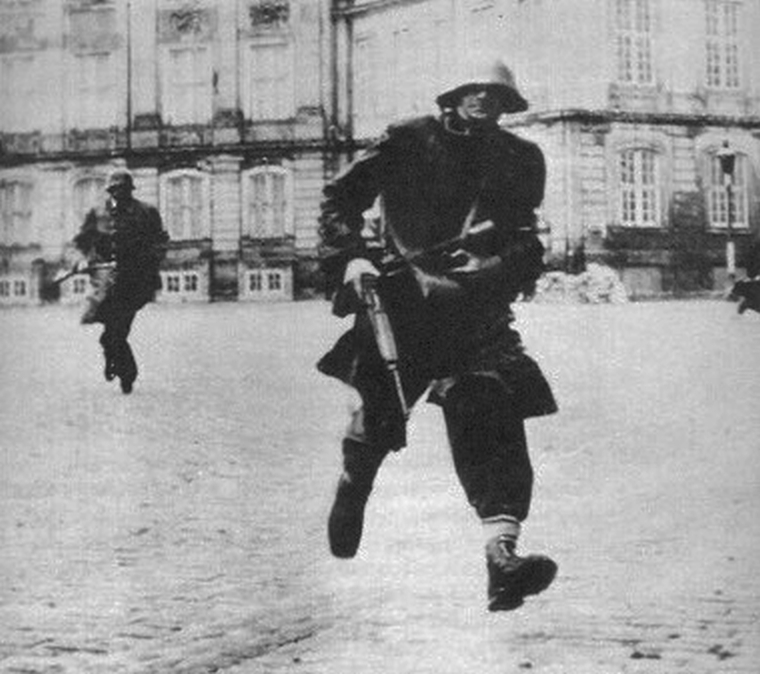 Soldier in the foreground is wearing the Danish Civil Defense uniform and helmet. He is running in front of the Amalienborg Palace in Copenhagen which is the home of the Danish Royal family. He has an M1 Carbine in his hand and another, unidentified, weapon in his arms. Although Denmark was allowed to retain it’s Palace Guard during the German occupation in WW2, it was not allowed to retain its Civil Defense forces. It seems that this soldier is part of the Danish Resistance some time in late war and has managed to get a hold of weapons. Wow, just ended skimming this post. Very wonderful content you wrote. Absolutely following your web! Thank you very much.